Kanji is among the TOP 10 paid educational apps in Japan! Over 2000 additional examples for a total of over 4000 examples. 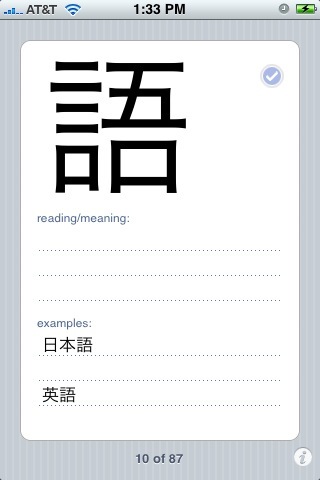 "Kanji" is a must-have flashcards application for anyone learning the Japanese language. It consists of 2040 kanji characters that are listed for taking the Japanese Language Proficiency Test - level 1, level 2, level 3, and level 4. For level 2, level 3 and level 4 kanji there are two exmaple words that use that kanji, and every example has reading in hiragana and the meaning in English. 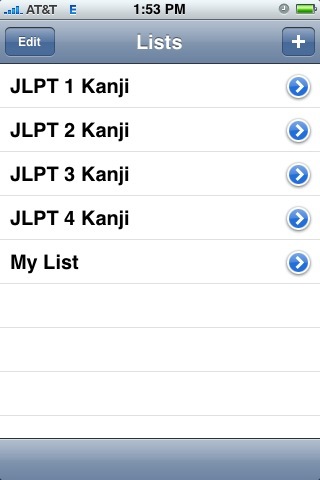 You can create and save your own kanji lists by selecting kanji that you want to learn from the set of 2040 available kanjis, meanings, and readings. 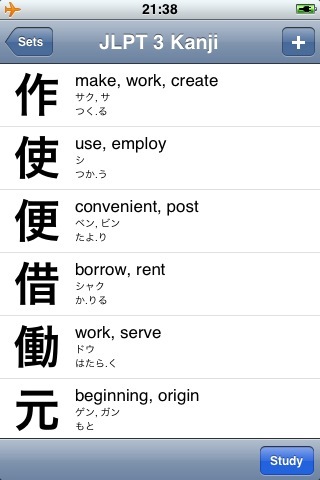 For example, you can create a custom kanji list that consists of all the kanji you need to learn for your next Japanese class. You can create as many lists as you want and can come back to them at any time. Every kanji in the set is represented with a large image on its own card. Tapping on the card will reveal on and kun reading and meaning. You can flip quickly through kanji meanings by swiping the card with your finger to move to the next or go back to the previous card. Checking off the card marks it as "mastered" and will remove it from the set for next reviewing. You can also go to the master list to manually select or deselect any of the kanji you want to include or exclude from the review. 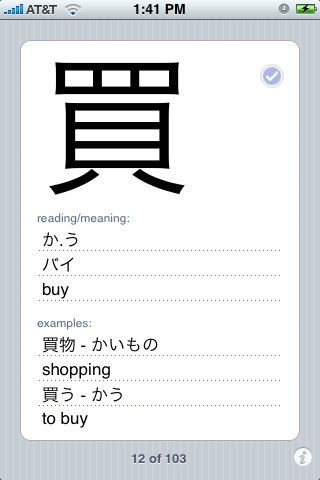 - two example words for all level 1, level 2, level 3 and level 4 kanji characters, over 4000 examples in total! - select which kanji you want to learn from the list of level 1, level 2, level 3, and level 4 kanji and create your own custom review and learning lists. 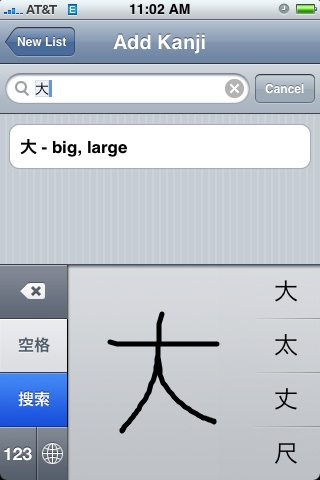 - search for kanji by entering a meaning or drawing the kanji (for drawing you need to enable and choose Chinese keyboard)*. - intuitive, clean, and simple interface - you move through the cards by swiping them with a finger. - shake to restart going through the list.